I was born in Hokkaido, Japan, and brought up there. “GAYU” calligrapher.Later I began to take lessons at a Gayu calligraphy school. but also for the SUMIE technique in calligraphic design.During my student years, I volunteered and assisted calligraphy classes for children in Japan and London. Since 2000 I work as a freelance artist and a professional calligrapher in Europe and Japan. 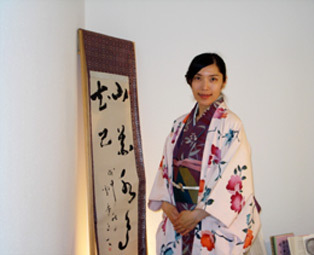 I give courses and workshops on “SHODO-the art of traditional Japanese calligraphy” in Europe since 2002. Yes, my passion for learning and teaching SHODO and the interest in developing the effective method of teaching this beautiful form of art has always been expanding.